My previous Jenga pistol and video were a viral hit, with over one and a half million views on YouTube. 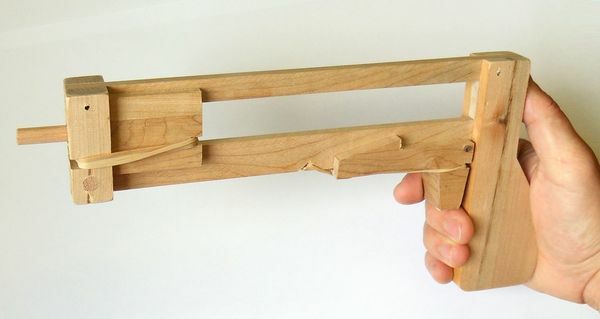 I experimented with selling Jenga pistols, but there were a few things, such as the pulley and the trigger mechanism, in that design that were fiendishly tricky and time consuming to construct, so I didn't make any past the first batch. I still get asked from time to time about buying a Jenga pistol, about dimensions for the Jenga pistol, and about plans for the Jenga pistol. So I thought I'd revisit that topic. Part of my goal was to try to simplify the design to make the Jenga pistol much easier to build. With some experimentation, I was able to establish that it's possible to stretch a rubber band enough that it is possible to pull the bolt all the way back without breaking the rubber band, yet still have the bolt come all the way forward without the bands becoming loose enough to fall off. This allowed me to eliminate the pulley that I ran the rubber band around on my old design. An added advantage is that it's now much easier to put extra rubber bands on the pistol to make it shoot extra hard! 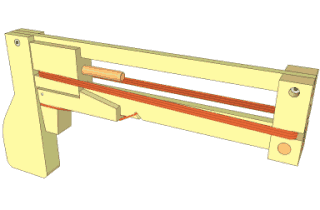 I designed the revised pistol in Google SketchUp. I printed the parts to 1:1 scale on paper to use as templates for cutting out most of the parts on the bandsaw. Following the lines on the printout to cut out the slots worked accurately enough, although I did have to trim them a little bit (also with the bandsaw) to get the right tightness of fit. I also cut the slots in the "bolt" piece, by putting the piece upright on the bandsaw table. 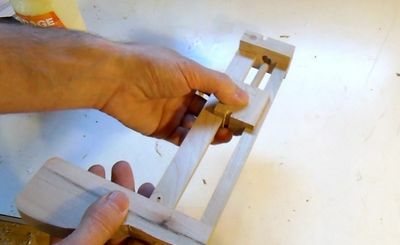 The original trigger was made out of two pieces of wood glued together. This time, I made it out of one piece. The grain of the wood is oriented such that the hook is strong. The trigger pull part is the cross grain part. I left that fairly wide so there's no risk of it braking. 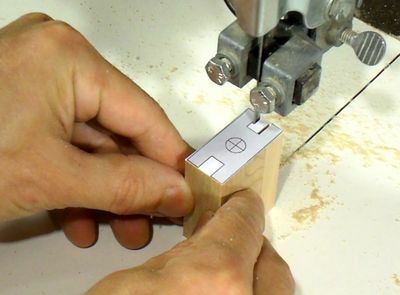 The trigger block has a deep slot cut into the middle so that it fits around both sides of the bottom rail. I reinforced the bottom corner where the muzzle is held on with a piece of dowel. 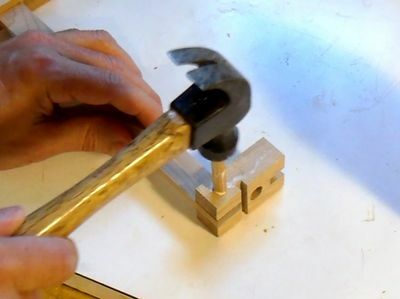 When the bolt is released and doesn't hit a Jenga block, its full force whacks against the muzzle block, so that needs to be attached very securely. It wasn't possible to cut everything on the bandsaw though. 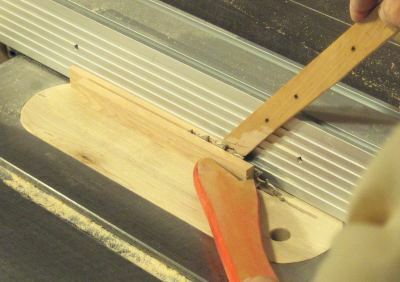 The straight rails that guide the bolts are best ripped on a table saw. I'm using a zero clearance insert to safely rip the rail. 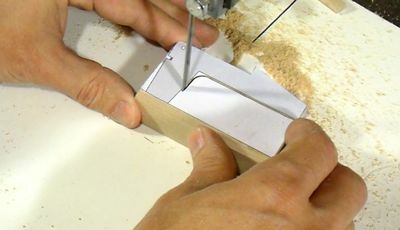 Without an insert, ripping stock this narrow usually results in it getting pulled into the slot next to the blade. The top rail is just attached with two screws. It needs to be removed when replacing the rubber bands. Having the rail removable also means I could still tweak the fit of the bolt if it ever gets too loose or too tight. The fit of the bolt is critical. It needs to be loose enough to slide freely, yet have very little play so that the pin on the front of the bolt always aligns with the hole in the muzzle block. A frequently asked question from people wanting to build their own Jenga pistol is "how long is the pistol". To get a sense of scale. 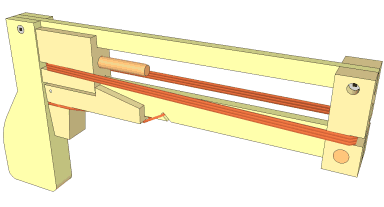 The rails that the bolt slides along are 24 cm (9.5 inches) in length, including the part that goes through the muzzle block and the handle. The bolt travel itself is 15 cm (about 6"). 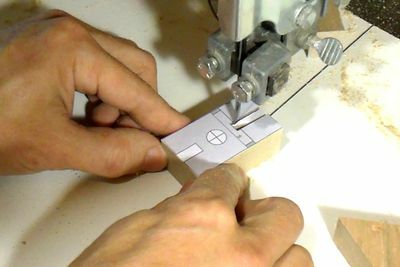 A video showing how the Jenga pistol is constructed, using my paper template plans.